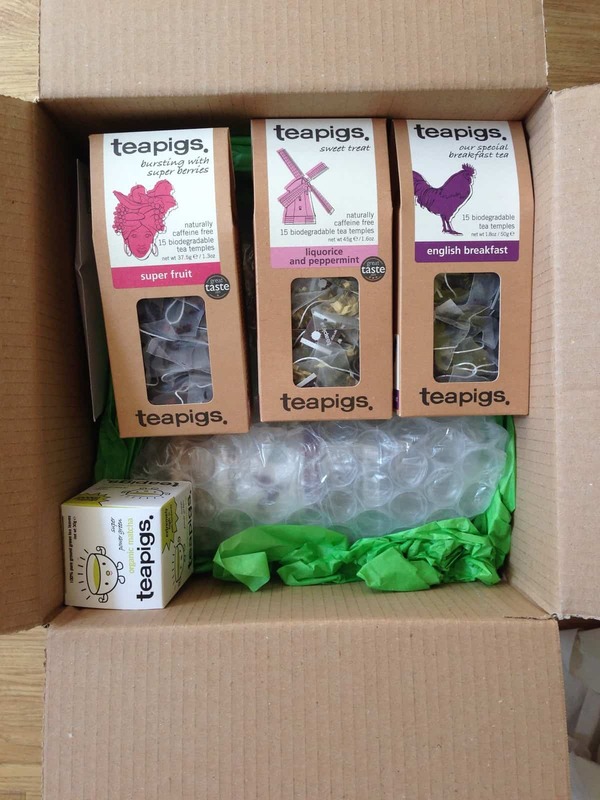 The teapigs subscribe & save box doesn’t work quite like the traditional subscription boxes. For the teapigs box, you go to their subscribe & save page and actually pick the teas you want delivered to you (every 1, 2 or 3 months). The huge benefit of subscribing to teapigs for your tea fix is that aside from getting delicious teas delivered to your door (delivery is completely free), you get 1/3 off every 3rd order you get. A teapigs addiction can get pretty expensive, so this is great news for tea lovers. But just because you pick your own teas doesn’t mean there are no lovely surprises in the box. 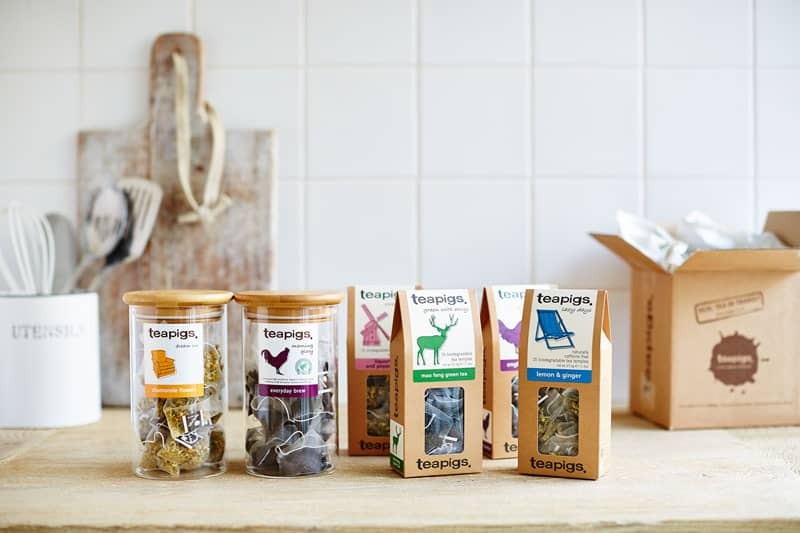 teapigs teas may have caught your eye in local coffee shops and restaurants as the pretty tea pyramids displayed in beautiful glass storage jars. You can already buy these jars yourself on the teapigs website for £10 each (which I didn’t know) but impressively, when you sign up to teapigs subscribe & save you get 2 of these glass storage jars free with your order! At the moment (September 2014), this is an introductory offer so worth checking it’s still the case when you sign up. As I’m sure is obvious, these really sealed the deal for me and I’m totally enamoured with them. They look really elegant (displayed or in a cupboard) and provide a good-enough airtight seal for teabags. The tea itself was the usual teapigs tea which I think is fantastic quality and incredibly fragrant. For anyone who isn’t familiar with teapigs, their tea is always whole leaf tea which give you a much better flavour in biodegradable tea temples. Of course the tea temples look pretty awesome inside those glass jars (just saying)! I thought this would be a good opportunity to try the organic matcha as well which is 100% ground green tea leaves. 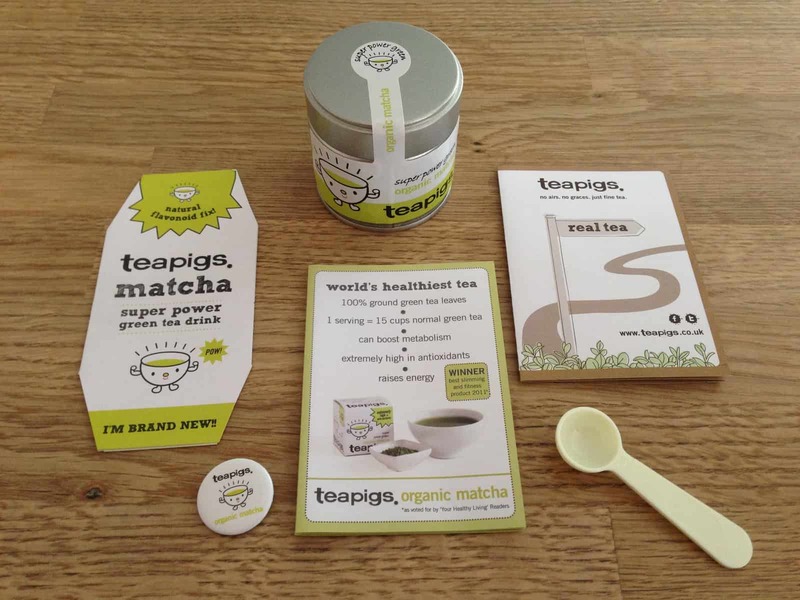 1 serving (half a teaspoon) is the equivalent of 15 normal cups of green tea and the teapigs match pot comes with 30 servings. For anyone who isn’t familiar with teapigs, they have a section on their site to help you figure out how to drink matcha and it comes with a super cute half teaspoon measure and informational leaflet on it’s health benefits. I tried mine in my morning fruit smoothies and it was delicious. Very smooth and really flavourful compared to other (cheaper) matcha powder I have tasted. What I really want to learn to make are those chocolate volcano cakes with a green tea centre – now that’s a good use of matcha! 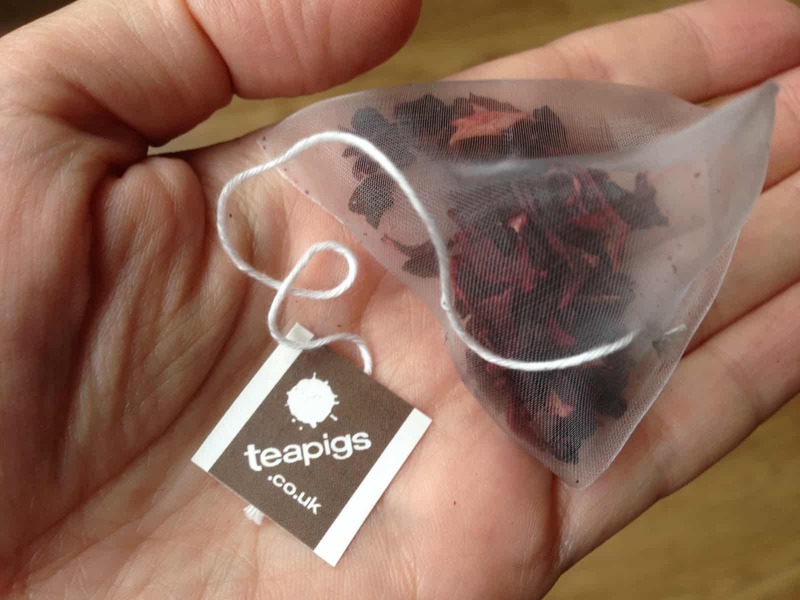 To round off the box, teapigs also included some single sample teabags. Much to my delight, these were of their more unusual flavours: rooibos crème caramel, popcorn tea and chai tea, which made for a fun tasting session. If you’re a teapigs tea lover this is a no-brainer. You’ll be getting your regular tea fix delivered to your door and sizeable discount on every third order for no extra effort on your part. 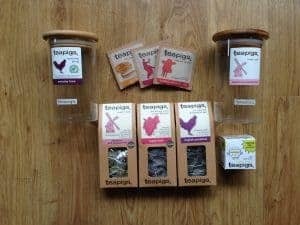 The only downside is that there is a £35 minimum order; but let’s be frank: teapigs products aren’t entirely cheap (though they do have bigger packs of certain teas where you can get excellent value), so you shouldn’t find it difficult to get through this amount of tea if you’re a regular drinker. 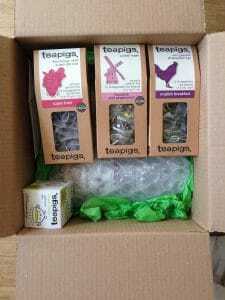 Personally I’m of the opinion that teapigs tea is incredibly flavourful and this box is without a doubt the best way to get value for money on teapigs products. It’s what teapigs fans and tea lovers have been waiting for. teapigs launched their online subscribe and save service! That’s real tea, to your door, hassle free. Plus subscribers get an exclusive discount – 1/3 off every 3rd order – wow! You choose, from the entire teapigs range, which teas you would like and how often you would like them delivered – once every one, two, or three months. teapigs will then deliver your tea order hassle free to your work or home so you never need worry about running out of tea again – hoorah! teapigs have made their subscription super quick and easy and you can change your choices or unsubscribe at any time. Why is it so great…. 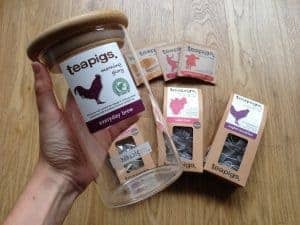 The teapigs subscription means you can get your regular teapigs order delivered at your convenience completely hassle free. No super market shops, no last minute web orders – teapigs will know what you want and when you want it. All new subscribers within the first 6 weeks, will receive 2 FREE teapigs glass storage jars worth £20. Free delivery on all subscription orders (minimum order value is £35). There is a minimum order of £35 and you can choose to receive your tea every 1, 2 or 3 months. If you subscribe in the first six weeks, you also get two fantastic teapigs glass jars (like the ones you see in all the cafés) for free with your order. How would you rate teapigs subscribe & save ?